The Cardiff Review (Poetry Editor): Selecting poems for the magazine. 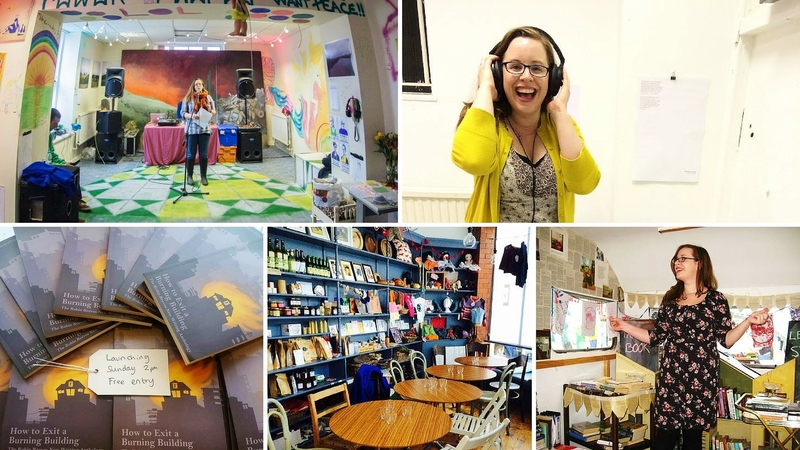 Made in Spring/Made in Roath (Poetry and Literature Coordinator): Coordinating writing workshops, local readings, open mics and all other poetry and literature events for the Made in Roath festivals. The Yellow Wallpaper – Short Opera (Librettist): Working with American-born, Bristol-based composer Blair Boyd to write a short opera based on ‘The Yellow Wallpaper’ by Charlotte Perkins Gilman. Writing Mentoring (Writing Mentor): Providing feedback, advice, and motivation for new writers in and around Cardiff. Currently mentoring one first time novelist and three poets. Death Writing (Facilitator): Developing and running a workshop series which provides a safe space for people to discuss death and write about their experiences of fear, grief, mortality, and loss. Email christinathathcer@gmail.com for more information. Welsh Writers Trust (Trustee): Working with other trustees to nurture new and well-established English-language writing in Wales through grants, competitions, workshops, and other events. The Gate Arts and Community Centre (Creative Writing Tutor): Establishing and running Roath Writers, a community group aimed at providing a welcoming space for writers of all levels to write, develop, and share their work in an informal workshop environment. Leading occasional professional creative writing workshops and summer programs as well. Please check the Gate’s for details of upcoming events website. Making Minds (Management Committee Member): Promoting the role of art and creativity in mental health across South Wales by developing partnerships with local organizations, coordinating and/or facilitating events, attending management meetings, and more. Please check the Making Minds blog for more information about the organization and its upcoming events. Landscape Writing (Co-Facilitator): Developing and running a workshop series set in a ramshackle gentry house in mid-Wales. Co-led with Emma Metcalfe, this series provides a chance for writers of all levels to develop their skills in a relaxed and supportive environment. Email landscapewriting@gmail.com for more information. Little Lantern Press (Guest Editor): Working alongside Editor-in-chief, Lisa Megraw, to select poetry for their first anthology on the theme of ‘Loss’. Ariel Magazine (Guest Editor): Working alongside Editor-in-chief, Helen Calcutt, to select poetry for the first issue of the magazine. Writing Our Lives (Facilitator): Developing and running a workshop series at the Butetown History & Arts Centre designed to encourage BME women, refugees, and asylum seekers to write about their own lives, the lives of their families, and their experiences of living in Cardiff. Email arts@bhac.org for more information. Valley Projects – Half Moon (Writer): Developing and running half-day walking and writing workshops across Wales. Check for details of upcoming events here. Voices of Roath (Founder): Establishing a free, seasonal open mic night which aims to provide the people of Roath (and beyond) with a space to share their poetry, prose, and other writing inspired by their community. Art and Poetry (Poetry Teacher): Developing and leading poetry workshops in schools as part of a ‘Collective Nouns’ project. Modern Alchemists (Writer): Responding to a piece of anonymous artwork and developing urban writing workshops as part of Solve et Coagula. Relaxation and Reflection Workshop Series (Co-Facilitator): Developing and running a workshop series with Charlotte Nock which provides a comfortable space for people to learn more about complementary therapies, take home some relaxation techniques and explore their creativity through reflective writing. City Writing (Co-Facilitator): Developing and running a workshop series set at the Cardiff Story Museum. Co-led with Emma Metcalfe, this series provides a chance for writers of all levels to discuss their experiences of Cardiff, write their own pieces inspired by the city, and perform their finished pieces at the museum. Email citywritingcardiff@gmail.com for more information. Dream Catcher Magazine (Guest Editor): Worked with a panel to select work for the magazine’s first women’s issue (#28). Milkwood Gallery (Writer in Residence: 2012-2013): Wrote creative pieces and developed workshops inspired by the gallery and community. MARGIN (Facilitator): Ran a writers group as part of ATTIC, a contemporary art gallery concerned with scientific, personal, and cultural understandings of the mind. High Street Primary School (Poetry Teacher): Developed and delivered four poetry lessons for Year 3 to Year 6 students as well as a “Teaching Poetry” inset session for the HSPS teachers. Literature Wales Cardiff Young People’s Writing Squad (Facilitator and Session Leader): Planning sessions, events, and retreats as well as working one-on-one with young people in each session. Glamorgan GATES (Creative Writing Tutor): Developed creative writing, blogging, poetry and map-making, and lunchtime literacy projects for excluded youth, community members, and primary schools students in Merthyr Tydfil. My Words, My Voice (Founder): Establishing an ongoing, under-25 open mic night in Cardiff with The Sprout. City Tutors Riverside (English Curriculum Leader): Developed and taught four, four-week sets of creative writing lessons for low-income, low-ability students.